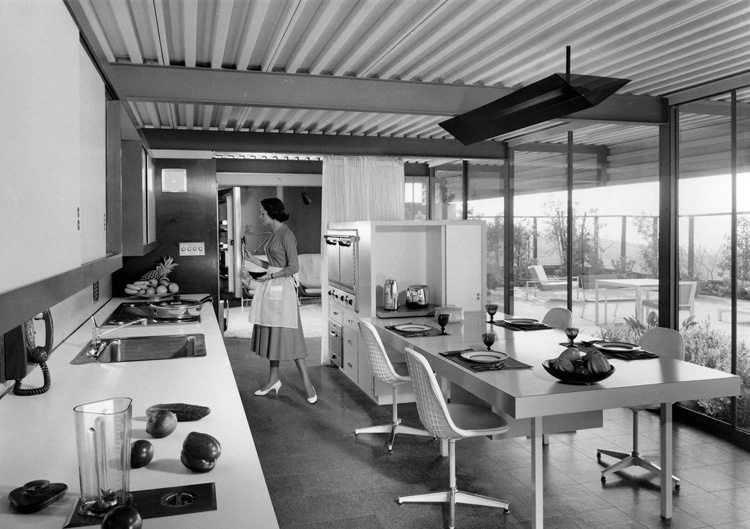 Inside the original Eichler X-100 kitchen. Two photos above represent the inside and outside of the Louisiana X-100 as it looks today. Its interior, of steel construction, even features small 'gardens' similar to those found in the original San Mateo X-100. Rogas, who grew up in the house as a child, said his parents bought it in 1964, from its first owners, who built it circa 1957, the year after Eichler built his X-100. He said his parents bought the house because "it was just in a great little neighborhood and it backed up to the Vermillion River." The family sold the house in the late 1970s. "The pictures you sent [of the California X-100] are almost identical to our old house. A few slight changes but almost exact," he told us. Over the years the Louisiana X-100 has held up well, a conversation with Edmond Dugas, who lives there now with his wife Clarisse, revealed. Dugas, who lived in the neighborhood, spotted the house in the late 1970s while jogging past. "I loved it because it was on the water. I wanted to be on the river," said Dugas, a retired air traffic controller. "And we liked the architecture. 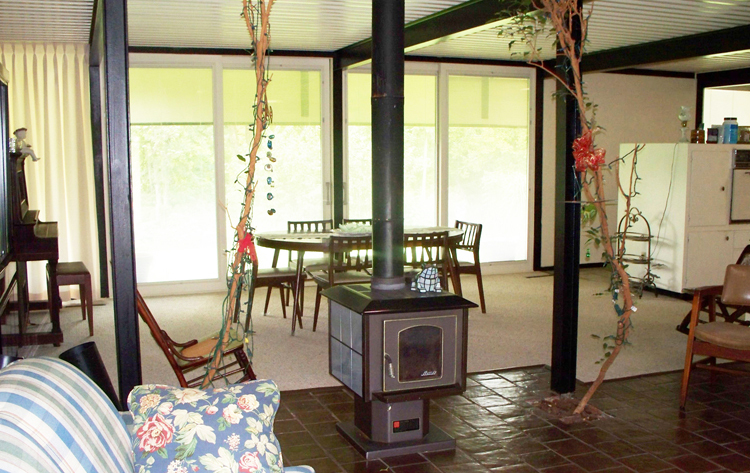 It's very open with a lot of windows and on a beautiful lot on the river." "The only negative to the house is the cooling and heating," he said, mentioning the 20-some skylights. "It's not energy efficient." Other than installing energy-efficient glass, Clarisse said, "We kept the house exactly as when we bought it." Rogas, who grew up in the house, didn't know who built or who, if anyone, served as architect for the Beverly house, obtaining the working drawings from Jones & Emmons and overseeing the project. But he thought his siblings might remember. They didn't. Clarisse Dugas said she knew who the architect was—Quincy Jones. She and her husband own one of Jones' books, Builders Homes for Better Living, which includes "a picture of our house," she said. Only it's not her house, it's the X-100 in San Mateo. "Why he was in Louisiana or how," she said of Jones, "we don't know." John Dugas, meanwhile, told us something else that deepened the mystery—the little old city of Lafayette was home to a second X-100, just a few houses down from 405 Beverly! This one, at 323 Beverly, which has been altered over the years, was owned by Floyd Breaux, who died in 2011. The local planning department could not provide information about the origins of either X-100 look-alike. "Sorry, we have no information other than what you already know about the house. You actually have more information than I was able to look up in our records here," plans reviewer Lee Degeyter wrote. He referred us to Roxana M. Usner with the Preservation Alliance of Lafayette. Usner, who was intrigued, immediately proposed the name of a man who, if he did not absolutely for sure serve as go-between between Jones & Emmons and the building contractor for the homes, certainly must have had something to do with the homes' birth. That was Dave Perkins.